activities in Niger this winter. Denis and I are impatient to return to Niger this month, and be welcomed by our dear friends and the smiling, laughing faces of the children we’ve grown to know and love in our Azawak communities. It will be refreshing to sip tea and share stories with our friends, eat fresh vegetables that they’ve been able to grow thanks to the borehole water and listen to songs the children have learned since they’ve begun attending the school that has opened now that water has become available. in a time of famine and crisis! Let’s back up one step, as I recap news from the media about Niger in 2011. 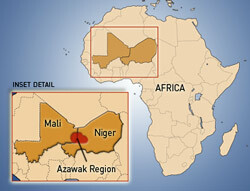 In January, Al Qaeda kidnapped two Frenchmen, who were both killed in a failed rescue attempt. All spring and summer, headlines focused on refugees fleeing Libya and entering Niger (a large number have fled to the Azawak). Last month we witnessed the death of Libyan leader Muammar Gaddafi. Though Gaddafi was a tyrant in the eyes of the world, he was often seen as a benefactor by the Tuaregs of Niger. While the rest of the world looked away, he offered assistance on the ground and jobs inside Libya. With his demise, the aid has dried up and almost everyone lost their jobs, removing not only a source of revenue but also causing an influx of refugees who are traumatized and find an impossibly bleak situation in the Azawak. To top off such a challenging year, headlines now announce one of the worst droughts since 2005 in Niger, where there has been up to 90% crop loss. Drought and famine have already begun ravishing the country. This parade of bad news has contributed to Niger once again being named second to last in the most recent Human Development Index. Our most recent news of hope could not be better timed. 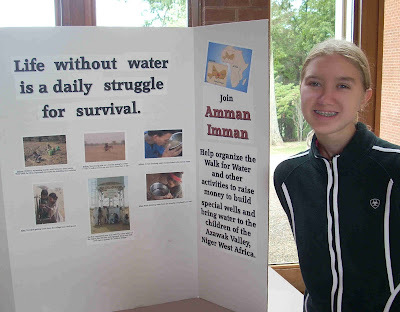 As many of you know, Amman Imman has food and revenue generating projects lined up for the fall and winter. We’ve been planning to do our utmost to help as many families and communities as possible survive this famine, as well as meet the extra demands created by the influx of refugees. Then, just last week, I received a call from the Vibrant Village Foundation announcing that they have pledged $130,000 to help cover a majority of the costs needed to build a new borehole. With a new borehole, our impact in terms of both water and food security will be multiplied. The Vibrant Village Foundation has offered a huge ray of hope that will help save many as they struggle through this new year of severe food and water shortage. We will share photos and stories of comforted villagers and dancing children celebrating this news as soon as we can! 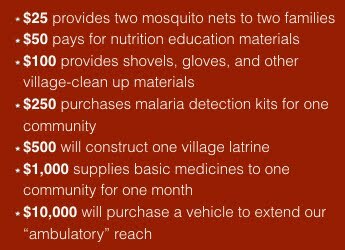 We still need to raise $70,000 to cover the remainder of the borehole costs, as well as our food and revenue-generating activities. Like many of the challenges that Nigeriens face on a daily basis, raising this amount before the end of the year may seem insurmountable. Yet we know that nothing is insurmountable. With your help, combined with the help of all our friends of the Azawak, we trust that our goal will be reached to offer thousands of rays of hope, gallons of precious life-giving water, and large plates of nutritious food to fill empty bellies in the Azawak this holiday season. Please…offer your ray of hope for the Azawak, for a borehole, food and jobs.